Quail Hill Publishing, 9780615779416, 242pp. Culinary queen Angie Amalfi has put aside her gourmet utensils to concentrate on planning her upcoming wedding to San Francisco homicide detective Paavo Smith. What could possibly go wrong? Instead of the answer to her heart's dreams, she scrambles to deal with wedding planners with bizarre ideas, wedding dresses that don't flatter, squabbling relatives with hurt feelings, a long-suffering groom, and worries over where she and Paavo will live after the wedding. But all of that pales when Angie finds the perfect house for them, except for one little problem-the house may be haunted. Many years ago, the newlyweds who lived in the house were murdered, and the case was never solved. While Angie pursues what happened to the couple who now may be haunting the house, Paavo obsesses over his own case involving the murder of unlikely lovers. The trail leads to ghosts, murders, unhappy families, and enough obnoxious wedding buttinskis to fill a graveyard. 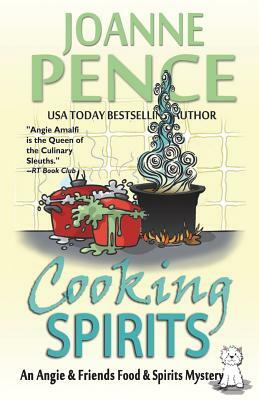 But when eerie happenings turn deadly, Angie fears she may be spirited away for good "Pence's tongue-in-cheek humor keeps us grinning." -San Francisco Chronicle "A tasty treat for all mystery and suspense lovers who like food for thought, murder and a stab at romance." -The Armchair Detective.